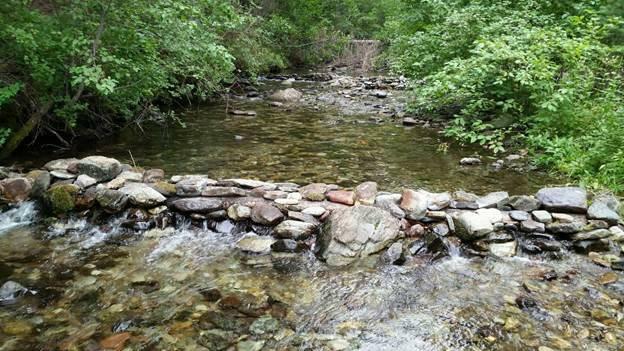 Kalispell, MT — As summertime temperatures heat up and the chance to cool down in the water arrives, Montana Fish, Wildlife & Parks is reminding people that building dams in creeks and streams can have negative consequences for fish. This is especially true for species such as bull trout, which ascend small tributaries in late-summer to spawn. In recent years, FWP has noticed an increasing number of dams being built in small streams. These harmful features are often built near campgrounds, most likely to pool water for swimming. Dams are also often found at dispersed camping sites and at bridges/culverts along National Forest roads. These dams may seem harmless but they can accumulate debris and build-up over time. Additionally, dams that are left in place can be expanded upon as new campers move into an area. While small dams can be washed out during spring, these features often remain intact and function as a passage barrier all the way through winter. Fish may have traveled a great distance from downstream areas and their inability to travel past a dam and spawn can impact a population for many miles downstream. You may have seen trout in dammed swimming hole pools and believe that by building a dam you are helping stream life and trout. This is not the case. Streams consist of a series of connected habitat types such as riffles, pools and side channels. By building dams, people limit the ability of all aquatic life from accessing these different habitats that they require at different times of the year. Natural geology of an area may cause certain portions of streams to contain “losing reaches.” A losing reach is a section of river where a percentage of the flow is lost underground, and the volume of water is decreased. Channel spanning dams (see attached photos) often occur in these areas and this can prevent large-bodied migratory fish from accessing quality spawning grounds in the upper portions of the stream.